UDM Downloads > K-Lite Pro! K-Lite Pro is the best available file-sharing program. It gives you access to files available all over the world. K-Lite Pro is the World's fastest P2P file-sharing application, letting users share and search for any type of computer files. 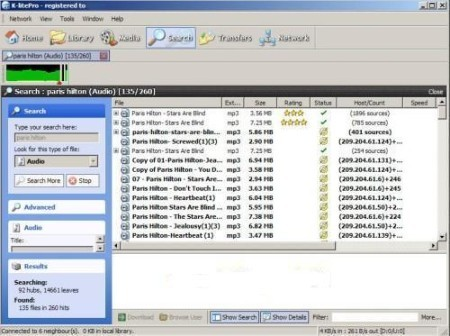 Download MP3s, Movies, Videos, Software, and Games. The application is easy to install, and very easy to use. K-Lite Pro respects your privacy and guarantees of no adware and no spyware. You will also never seen any advertisement during using K-Lite Pro. Features include dynamic querying, the ability to preview files while downloading, advanced techniques for locating rare files, and an extremely intuitive user interface. Don't worry about corrupted files, because K-Lite Pro detects corruption before the download is completed. K-Lite Pro can download single files from multiple users to ensure you get the most efficient use of your bandwidth. K-Lite Pro supports multiple networks including eDonkey2000, Gnutella, BitTorrent, and Gnutella2.